Mridula started her school of dance, 'Silambam', in Pittsburgh, USA in 2005. Having moved to the City of Pearls (Hyderabad) a couple of years ago, Mridula started Silambam in Hyderabad in November 2008 and it has grown rapidly into 2 branches in Hyderabad. She has also sucessfully conducted 'Arangetrams' of her students. She has also given lecture demonstrations on various subjects in numerous places like Trichurapalli etc. Having completed her Diploma in Fine Arts, she is currently pursuing her Masters. 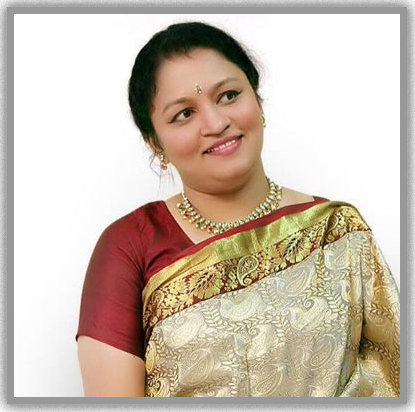 With the blessings of her guru Mridula started her school of dance, 'Silambam', in Pittsburgh, USA in 2005. 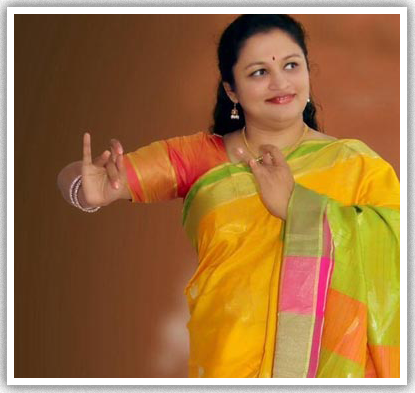 Started due to her interest in continuing the unique Sree Bharatalaya tradition of Bharatanatyam, it has now grown into a close knit class whose students echo her enthusiasm for learning the intricate dance form. Silambam Hyderabad is an arts organization and a premier dance school in the Hyderabad area. Silambam aims not only to impart dance education, but also to turn out well-rounded, artistically sensitive and culturally refined individuals. Silambam students receive a holistic education, which includes firm grounding in Bharatanatyam theory and cultural history, basic Indian classical music instruction, fitness and body conditioning, and rigorous fundamental training and technique refinement. Much emphasis is placed on mental and physical discipline, and on the importance of practice, passion, dedication, and perseverance. Attendance: Attendance at every class is compulsory, except in the case of extenuating circumstances (this does not include birthday parties, weddings, or play dates!). Please note that your child NOT attending classes do not mean fees would be refunded for that month or that fees need not be paid for that month. Make-up classes: If absence is foreseen but unavoidable, please call ahead to inform the teacher. Classes missed due to illness only can be made up if informed in advance, at one of the other classes. Fees: Please note that Silambam will NOT accept credit cards. Tuition may be paid via recurring automatic monthly payments (you will need to provide a voided check during registration so we can set this up), or annually (provide a single payment by check in June). Recurring payments will be processed on the 5th of each month. Any changes or cancellations to recurring payments must be communicated by the 20th of the previous month. The fee structure is as follows: a) Registration Fee: A one-time annual registration fee of Rs.500 is due at time of joining; this will cover administrative expenses. b) Tuition: Our tuition is based on an eleven-month dance year. (We have December and April as half-months starting 2015). Students who pay annually receive one month free. Punctuality: Please come to class ON TIME, preferably five minutes ahead of time. Attendance at Performances: Observing good dancing is an integral part of your dancer's education. Please make every effort to attend as many performances by local and visiting artistes as possible. Dance attire: Every student must wear Patiala pyjamas, comfortable enough to dance in, and cotton, short-sleeved kurta/kameez. A cotton dupatta/angavastram must be brought to tie around the waist. 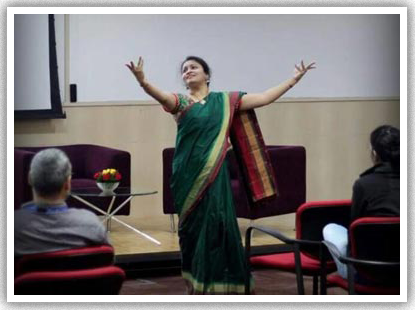 Older students must wear a dance saree tied over a salwar. Please wear a bindi unless you have religious/cultural reasons not to. Hair style: Loose hair (short or long) bothers and distracts the dancer; hair must be pulled back neatly from the face, short hair pinned back, long hair in a ponytail or braid. Bangs, if any, must be pinned back. Practices: Every student is required to practice at least two times a week, 30 minutes each. Observing classes: Parents are requested not to sit in on classes. This is typically distracting to the students and to the instructor. Parents may sit in on one class at the time of enrollment. Class notes and resources: Class notes, audio recordings, dance theory notes, etc. can be got from the teacher for more advanced students. Please contact the teacher for access to this resource. Recitals: Our class has many students at different stages and we make it a point to invite parents to each event to see the progress their child has been making. This is a unique opportunity offered only by Silambam Hyderabad with a more intimate in-studio student showcase that nevertheless gives students the excitement of performing in front of friends and family. Vijayadasami pooja: Every year at Vijayadasami, an annual open house will be held. Parents, family and friends are welcome to this event. This is your opportunity to see your dancer's progress, as well as interact with the teacher. There is a pooja that is done and the children move onto the next stage. Performance Policy: Students who have reached the Advanced level will receive their salangai (bells) and will be trained to perform at the salangai pujai. However, to conform to established standards, the time to arangetram (solo stage debut) will depend on the ability and quality of the student. Arangetram-track and post-arangetram students will be offered various performing opportunities at cultural events through the year. However when a student is ready is decided by the teacher. If you want quick results and/or frequent performing opportunities during the learning stages, this is not the right school! Curriculum: Silambam follows a comprehensive syllabus, modeled along the Bharatanatyam syllabus of the Imperial Society for Teachers of Dance (www.istd.org) which includes modules on History/Background, Dance Theory, Fitness and Body Conditioning, Technique, and Ancillary Subjects (Music and Rhythm). Pooja: For new joiners, we usually start with a pooja so please do bring some flowers and fruits on a plate along with registration of Rs 500. A cd detailing theory will be given. Welcome and we hope you enjoy your dance journey with us! !